We are back in Saint Louis now and are enjoying some much deserved down time today. I’ve been playing with my pictures and have chosen to show this one first. The late afternoon light in it is just magical. It is from the Cloisters. This museum, with its emphasis upon medieval art reminded me of the Getty in LA. The collections at both museums emphasize this period, but more importantly, at both museums the box is as intriguing as its contents. At the Getty, the box is all modern, with only an abstract allusion to the medieval village that it is supposed to represent. While at the Cloisters the box is studded with actual artifacts from that time. The effect then is that the museum itself is a work of art. Like many of the architectural details at the Cloisters, this particular cloister was either rescued, salvaged or looted, take your pick, because I’m sure that all these points-of-view are equally applicable. It came from the Benedictine monastery of Saint-Michal-de-Cuxa, in Perpignan, France and dates to 1146. Sacked in the 17th-century, the monastery had fallen into ruin by the 19th. As reconstructed here, the cloister is about a quarter the size of the original, though its proportions are the same. Some modern stone was required for the reconstruction, but as a gesture towards authenticity, it was quarried from the same 12th-century quarry. 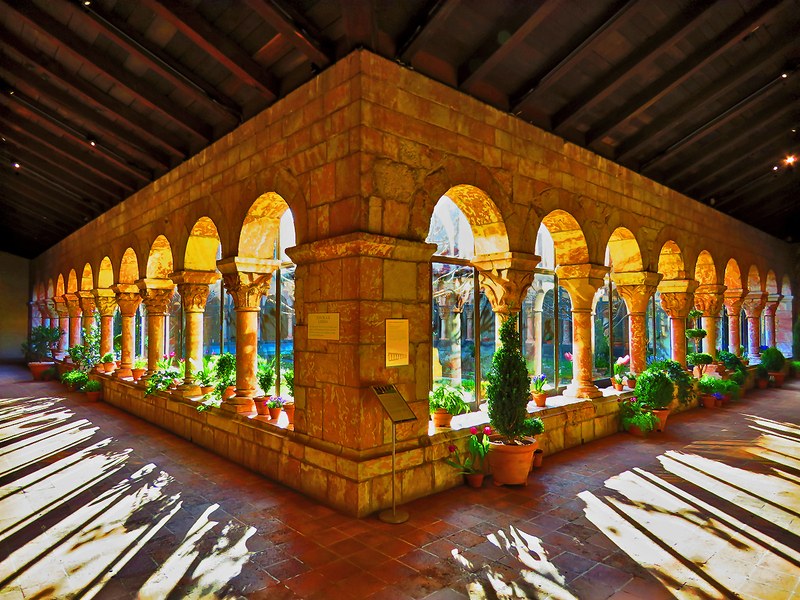 This entry was posted in Art, Life, Photo, Photography, Saint Louis and tagged NYC, The Cloisters by RegenAxe. Bookmark the permalink.